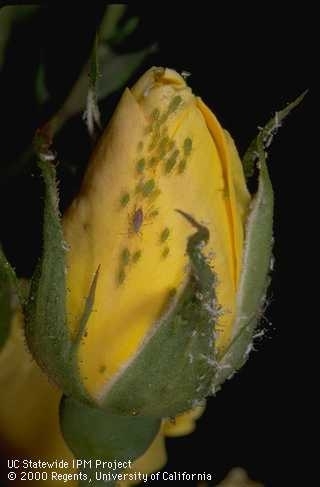 Horticultural oils can be used to control aphids on roses. Oils are some of the most useful pesticides available for managing pests on woody ornamentals and fruit trees. They are also widely used on many herbaceous flowers and vegetables. Oils control a range of soft-bodied insects and mites, as well as several foliar diseases including powdery mildew (Table 1). Not only do oils leave no toxic residues, they are safe to use around people, pets, and wildlife; have low impact on beneficial insects; and won't harm honey bees unless applied directly to flowers during the time of day that bees are foraging. Oils used for managing pests on plants are most often called horticultural oils. Horticultural oils are derived from petroleum sources, and are sometimes called mineral oil, narrow range oil or superior oil. Other oils produced to control pests may be made from plants, such as canola oil, neem oil or cottonseed oil. A number of other plant extract oils have also recently become available on the market. Regardless of their source, the primary way oils kill insects and mites is the same — by suffocation. Insects breathe through structures called spiracles. Oils block spiracles, reducing the availability of oxygen and interfering with various metabolic processes. When applied to insect or mite eggs, oils can penetrate the shells and kill the developing embryo. Oils may also act as a repellent in some cases, especially with some of the plant-based oils, and some such as neem oil have anti-feeding properties. Because oils kill by smothering insects, apply the product so it completely covers the target pests. Careful attention must be paid to treat both the underside and topside of leaves, buds, and shoots and all locations where the insects or mites may be located. Spraying during the dormant season, when leaves are off trees or shrubs, is recommended for scales and some other insects, because it is easier to get good coverage on leafless trees. Because oils leave no toxic residues, they won't generally kill insects that move onto plants after treatment. Usually, immature stages of insects are most susceptible, especially with scale insects, mealybugs and true bugs. Insects that feed within curled leaves, such as leaf-curling aphids, leaf miners, or gall-forming species, are protected from oil sprays and not well controlled. Oils don't control caterpillars, beetles, grasshoppers, and boring insects, with the exception of some caterpillars in the egg stage. In some cases, oils improve the efficacy of other insecticides. For instance, applications of both codling moth granulosis virus (Cyd-X) and spinosad are more effective against codling moth when 1% oil is added to the spray. For managing certain foliar diseases such as powdery mildew, oils can act as both a preventive and a curative fungicide, smothering fungal growth and inhibiting spore production. In many cases, the efficacy of oils in reducing powdery mildew is superior to standard synthetic fungicides, especially in reducing existing infections. All oils now sold as pesticides are highly refined and can be used safely on most plants throughout most of the year, unless plants are drought-stressed. Exceptions include Japanese and red maples, walnuts and smoke tree. Redbud, juniper, cedar, spruce and Douglas-fir are also sometimes injured. Injury usually involves discoloration of leaves or needles. Walnut is very sensitive to oil sprays applied during bud break, and applications aren't recommended during the dormant season because of potential damage to buds and shoots. Many plants are sensitive to oil damage when water-stressed, so be sure plants have been adequately irrigated before application. Most oil labels also warn against applying oils when temperatures are below freezing or above 90°F. Oils shouldn't be applied in combination with sulfur, or within 30 days of a sulfur application, because of potential phytotoxicity. As with any pesticide, always check product labels for precautions or other restrictions before applying. Table 1. Plant Pests Oil Sprays Control. What Can Landscape Managers Do to Help Honey Bees? I want to avoid any dormant tree sprays with Neonicotinoids in them. Labels don't tell me everything. How can I avoid those Neonicotinoids? then how do I know that they are safe? The label will tell you specifically if it contains any Neonicotinoids or other chemicals. "other ingredients" refer to inert ingredients that act as solvents or prolong shelf -life. These are not active against the pest and you should not have to worry about their safety. Any insecticide combined with the oil will have to be listed under "active ingredients". Look for things such acetamiprid, clothianidin, imidacloprid, nitenpyram, nithiazine, thiacloprid and thiamethoxam in the active ingredients section, these are common neonic insecticides. Hope this helps! I just wonder can I use oil spray on my pepper plants even if they have no aphids yet. I need to move them indoor before Winter arrives. Would it be able to kill all the aphids in their egg stage?